Two Russian cosmonauts and a NASA flight engineer bid their three space station crewmates farewell Sunday, strapped into their Soyuz ferry craft, undocked from the lab complex and fell back to Earth, making a pinpoint landing in Kazakhstan to close out a 125-day voyage. Descending through a clear blue sky under a large orange-and-white parachute, the charred Soyuz TMA-04M descent module settled to a rocket-assisted touchdown near the town of Arkalyk at 10:53 p.m. EDT (GMT-4; 8:53 a.m. Monday local time). 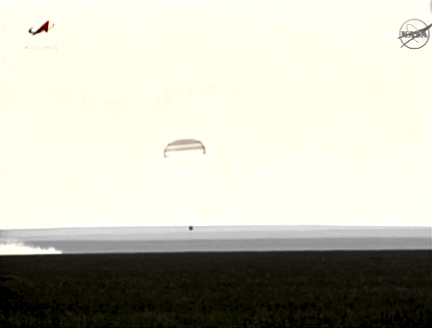 The final stages of the descent were carried live on television relayed through the Russian mission control center and NASA's satellite network, showing the last-second firing of the crew's braking rockets and billowing clouds of dust and smoke as the module touched down and the parachute collapsed. Russian recovery teams deployed near the landing site quickly rushed in, reporting the descent module had tipped over on its side, a relatively common occurrence. They quickly got to work opening the main hatch to help Soyuz commander Gennady Padalka, flight engineer Sergei Revin and Joseph Acaba out of the cramped module after four months in the weightlessness of space. Padalka, the first out, looked relaxed and in good spirits as he rested in a recliner and enjoyed a cup of tea. Revin and Acaba quickly followed suit and all three were given quick medical exams before a two-hour helicopter flight to Kustanai. At that point, the crew planned to split up, with Padalka and Revin flying back to the Gagarin Cosmonaut Training Center in Star City near Moscow while Acaba flies back to the Johnson Space Center in Houston aboard a NASA jet. Touchdown on the steppe of Kazakhstan marked the conclusion of a 53-million-mile 2,000-orbit voyage that began with liftoff from the Baikonur Cosmodrome on May 15. It also moved Padalka up to No. 4 on the list of most experienced space fliers, with 711 days in orbit over four space flights. Acaba has now logged 138 days aloft during two missions while Revin's mark will stand at 125 days for his first flight. The trio bid their three Expedition 32 crewmates farewell Sunday afternoon, moving back aboard the Soyuz TMA-04M spacecraft that carried them into orbit last May. They undocked from the Poisk compartment attached to the station's Zvezda command module at 7:09 p.m. as the two spacecraft sailed 250 miles above Kenya. After moving about seven-and-a-half miles away from the space station, Padalka monitored a four-minute 16-second deorbit rocket firing starting at 9:56:18 p.m., slowing the ship by about 258 mph to begin the long fall back to Earth. At 10:40 p.m., the spacecraft plunged back into the discernible atmosphere at an altitude of 63 miles. Just before atmospheric "entry interface," the three modules making up the TMA-04M spacecraft separated and the central crew module, the only one equipped with a heat shield, continued the descent. After enduring the hellish heat of atmospheric friction, the Soyuz descent module deployed its braking parachute around 10:38 p.m., at an altitude of about 6.6 miles. Recovery crews quickly spotted the spacecraft and Padalka radioed that all three crew members were in good shape. Acaba, a former high school teacher and shuttle veteran, operated a battery of laboratory experiments during his stay in space, performed maintenance as required and operated the lab's robot arm during two dramatic spacewalks by Williams and Hoshide to replace a faulty power switching unit. "We're at times glorified maintenance personnel," he said in a pre-flight interview. "It's just like living in your house. On a Saturday, you know, you got to fix the plumbing, you've gotta, you know, cut your yard, things break down, and the space station is very complex and takes a lot of our time to maintain it. "If you look at the amount of time we spend on science, there's a goal of about an average of 35 hours per week between the three (U.S.-sponsored) crew members. When I first heard that number, well, it seems like a pretty small number, but if you look at other extreme environments where people are studying and living, we're right on par if not higher, because it takes a lot of effort to maintain this very complex laboratory-home up in space." That responsibility now falls to Expedition 33 commander Sunita Williams, veteran cosmonaut Yuri Malenchenko and Japanese astronaut Akihiko Hoshide, who were launched to the space station aboard the Soyuz TMA-05M spacecraft July 15. They will have the sprawling lab complex to themselves until Oct. 17 when three fresh crew members -- Soyuz TMA-06M commander Oleg Novitskiy, Evengy Tarelkin and Kevin Ford arrive two days after launch from Baikoniur. In a change-of-command ceremony Saturday, Padalka formally turned over command to Williams, a veteran astronaut and military helicopter pilot making her second long-duration stay aboard the station. "I would like to express my (gratitude) to my crewmates for keeping (a) great psychological climate on the crew, sharing everything between us, we got along very well," Padalka, speaking English, said during the change-of-command ceremony. 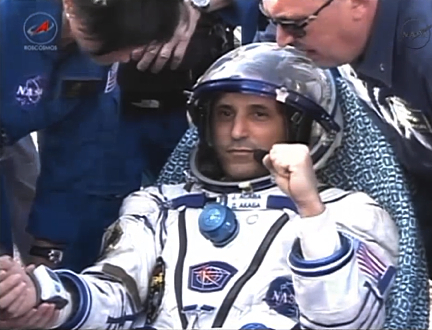 "It's time for tradition, 32 crew to hand over command to the new crew commander, Sunita Williams." "Thank you Gennady, and thank you everybody," Williams replied. "Just like Gennady said, I want to thank everybody on the ground for preparing us, but most of all for the last two months I'd like to thank our (Expedition) 32 crewmates here who have taught us how to live and work in space and, of course, to have a lot of fun." Speaking to Padalka, she said "you pay more attention to the people that work with you and for you than than the people you work for. And that's universal leadership." "I appreciate all the lessons learned and again, all the great humor that we've had up here," Williams said. "It's been a lot of fun and that's mostly because of you and your crew. We hope as our crew, Aki, Yuri and myself, to maintain that and pass that on to Kevin and Oleg and Evgeny when they get here. So thank you."